President Muhammadu Buhari yesterday promised to complete the Mambilla Hydropower project and open up Taraba State for investors, if he is re-elected. Doing so, he noted, will stimulate investorsâ€™ interest in the enormous natural resources waiting to be tapped for development in the state. It was at the presidential and governorship rally in Jalingo â€“ the Taraba State capital. â€œThe Mambilla Hydropower Project is the main project that will bring accelerated development in your State; it will generate enough electricity for you to do businesses and improve your living standard. I will complete it, if you re-elect me,â€ he said. Buhari, who acknowledged Taraba as an agrarian state, promised to tackle poverty and enhance Taraba farmersâ€™s access to fertilizer at subsidised rate during cropping seasons. â€œWe will also construct a railway line from Benue to Taraba up to Borno State to ease the movement of goods and farm produce. We would ensure that the state is open to enormous development,â€ the President said. He disclosed that he would continue his fight corruption and will make sure he fights Boko Haram to finish. APC National Chairman, Adams Oshiomhole, described Buhari as the best man for the job among the 73 presidential candidates. According to him, the PDP had died and decayed since 2015 and should not be expected to resurrect at the polls. Some of the defectors received by the APC chair received include: Emmanuel Bello (former Public Affairs aide to Governor Darius Ishaku), Abba Akawu, (former commissioner of Poverty Alleviation) and Emmanuel George (former Special Adviser to the governor on Youths Development). Sani Abubakar Danladi, who is the Taraba APC standard bearer, called on the people to come out en masse and vote for Buhari on February 16. In Yola, the Adamawa State capital, President Buhari vowed to continue the fight against corruption, promising that all cases of corruption will be prosecuted without sparing anybody no matter how highly-placed. He was welcomed by a huge crowd of party supporters who thronged the Mahmud Ribadu Square in Jimeta. According to him, all looted funds will be recovered and returned to government treasury for the public good. Oshiomhole urged the people of Adamawa State to vote for Buhari for what he had done for them and not their kinsman, Atiku Abubakar of the Peoples Democratic Party (PDP), who he alleged did little or nothing for the state while he held the sway as vice president. â€œLetâ€™s move away from the consideration of where people come from to what they have done for the people they have been responsible for,â€ Oshiomhole told the crowd. He added: â€œAsk Atiku what he did for you when he was the vice president between 1999 and 2007. 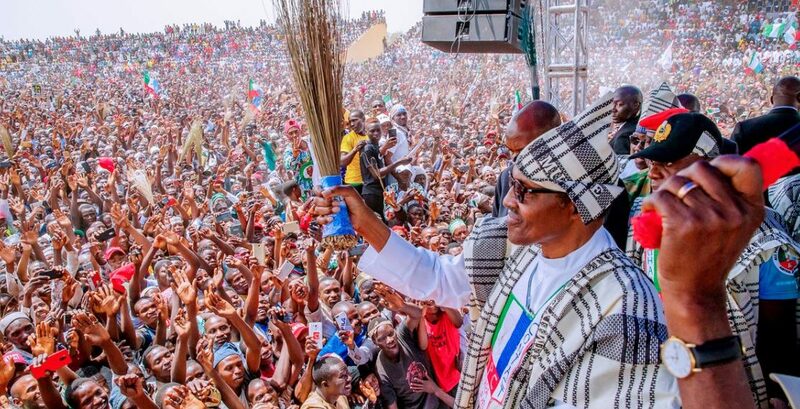 He told the people to compare such a person with President Buhari, who he said had built and is building more roads across Adamawa State in less than four years that he has been President than Atiku might even have thought of doing in the eight years he was in power as the vice president. A highlight of the presidential rally was the presentation of APC flags to many flagbearers of the party, including Governor Mohammed Bindow, his deputy, Babale Martins, who are seeking re-election.